To find out more about the Karel F. Liem Imaging Facility including usage, please contact Dr. Adam Summers. Recently, a cutting edge micro CT scanner was ordered for the Karel F. Liem Bioimaging Facility. The Bruker Skyscan 1173 can image specimens up to 140mm in diameter and 200mm in length with a resolution of 7μm. That is good enough to pick out tiny bone cells in a specimen the size of a can of tomatoes. The machine will have a special stage that can load the specimen with as much as 400N of force before scanning. This could be used to scan a shell before and during the application of a ‘bite force’ to see how the structure rearranges when stressed. The scanner boasts a 130kv energy source which makes it appropriate for biology and for paleontological specimens — which are nearer geology than bone or shell. A CT scanner is used to visualize differences in radioopacity in a specimen, and is best known from the medical world, where it is often called a CAT scanner. Though most CT work is done on ‘hard’ tissues like vertebrate bone and the mineralized exoskeleton of invertebrates, recent work on contrast agents allows soft tissues to be seen. The material to be scanned can be fresh, fixed or even dehydrated. However, since scans usually take several hours it is important that the sample be very stable. Even slight movements due to drying or temperature changes will reduce the resolution of the scan. 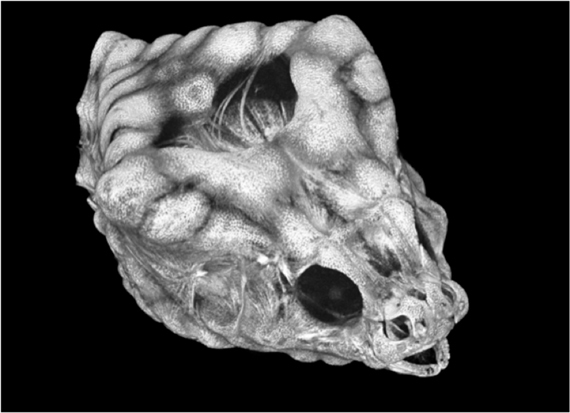 Once the sample is scanned there are free open source software programs that can be used to produce images such as the dermal skeleton of the rockhead poacher (Figure 1). These programs are relatively easy to use and there are several sources of tutorials that will get our users oriented. Visualization is just the beginning of the uses for CT scanning; the digital models can be used in finite element analysis, computational fluid dynamics, physical model production (from 3-D printers) and 3-D morphometrics. This tool, and the associated hardware, should be of interest to a wide range of biologists, paleontologists and potentially industrial users. The scanner is the flagship device in the newly created Karel F. Liem Bioimaging Facility. 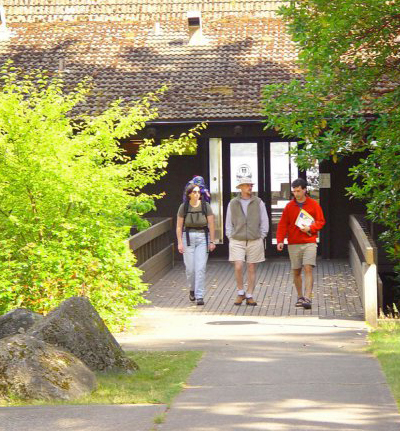 Karel founded the influential summer fish course at Friday Harbor Labs and mentored many current and past FHL students, post-docs and faculty. His deep love for fishes and for morphology led to a spectacular career in comparative biomechanics. He was the Henry Bryant Bigelow professor of Ichthyology at Harvard’s Museum of Comparative Zoology, and a visiting professor at the UW for many years. With Bruce Miller (UW School of Fisheries and Aquatic Sciences), he taught a graduate course that launched dozens of careers, including ours. Karel’s encyclopedic knowledge of fish anatomy and his deep and broad understanding of foundational literature made him an outstanding mentor. His kindness, sense of humor and willingness to put in time and effort for young scientists made him an outstanding colleague and mentor. Karel was generous with his knowledge and his equipment, and in this spirit the tools of the Karel F. Liem Bioimaging Facility will be available to all FHL researchers without charge. This policy is made possible by gifts from Karel’s former students and colleagues that led to an endowment to be used to service the CT scanner, scanning electron microscope and other tools in the Karel F. Liem Bioimaging Facility. The scanner itself was purchased with generous contributions from the Lyman B. Brainerd Jr. Family Foundation, the Drollinger Family Charitable Foundation and other private sources, as well as extensive support from the University of Washington College of the Environment, UW College of Arts and Sciences, individual faculty and their departments. This is a reprint of an article published in the FHL Fall 2015 e-newsletter written by Adam Summers and Beth Brainerd.